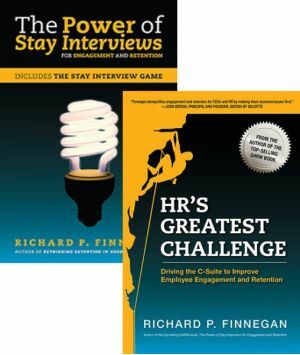 The Employee Engagement and Retention Kit consists to two books by Richard P. Finnegan. The first book is The Power of Stay Interviews for Engagement and Retention, which provides HR professionals, line managers, and business leaders with the rationale, tools, skill sets, processes, accountabilities, and cases studies to demonstrate that the impact of Stay Interviews “is not only to count a reduced number of voluntary resignations but also to note the far fewer times that managers say of a leaving employee, ‘I wish I had known he felt that way.’” This book is ideal for employee relations professionals and line managers/supervisors. The second book in the kit is HR’s Greatest Challenge: Driving the C-Suite to Improve Employee Engagement and Retention. This book will help HR executives convince their CEOs that engagement and retention are top-tier metrics as important as sales and service; replace those mysterious turnover percentages and engagement scores with dollar values that resonate with the CFO; ask leaders to forecast how long employees will stay and how many of their team will score high on the next engagement survey; and most importantly, solve employee engagement and retention as a business issue. Richard P. Finnegan is the CEO of C-Suite Analytics, which helps organizations engage and retain their employees.